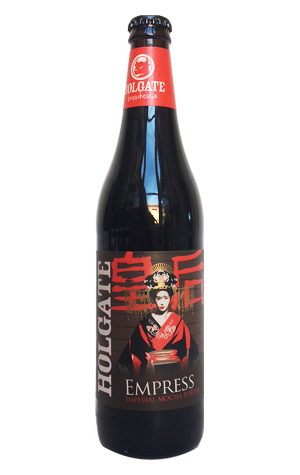 It’s been a full decade since Holgate first released Temptress, a beer that’s won its fair share of love from both beer fans and judges over the years and claimed yet another trophy, for Best Porter, at the 2018 Australian International Beer Awards. It’s also been more than seven years since the brewery debuted Empress – an imperial homage to Temptress. Where Temptress makes a feature of Dutch cocoa and Madagascan vanilla, the Empress adds coffee – it is an imperial mocha porter, after all. For the 2018 version, Moto Bean Coffee Roasters, from Malmsbury, a town not too far away from the brewery’s Woodend home, supplied the beans. Their combined efforts result in a beer with a silky mouthfeel and luscious body, its fullness aided by both Belgian candi syrup and oats. Much like its older sibling, it’s a beer that brings together dark chocolate and vanilla with big toasted, roasted aromas. There’s also plenty of coffee and a roasted bitterness on the palate, where those flavours are joined by hints of raisin and, perhaps unsurprisingly when it weighs in at 10 percent ABV, a touch of booziness too.